In November, 2012, I reviewed a CD by an Indie artist out of the Phoenix area. The album was “Right Where He Wants To Be” and the artist was Paul Ludenia. As I say in my interview with him (here), since the time of that review, Paul and I have become good friends. I’ve kept up with his performances in the Phoenix area as well as the progress on his latest CD, “BOOM!”. “BOOM!” is another great collection of ten original tunes by Ludenia. Each are heavily influenced by the vast range of genres that have influenced Paul throughout his life. It’s amazing how he weaves those influences into delightful, thought provoking tunes – almost to a whole new genre of his own. Each of the ten songs are worth the price of the CD, for sure. So, I’m randomly picking three favorites to highlight. Karma Come – In my interview with Paul, he talks about this powerfully painful tune about physical abuse in relationships and the true story that inspired the song. I would pay the price of the entire CD for this one thought provoking tune. Life Got In the Way – The title alone is what first commanded my attention. Who can’t relate to this? Paul wrote this partly from his own experiences of having to make hard choices that impacted his pursuit of his musical passions. Catchy and introspective, this song is a keeper. When You’re Talking To Me – I love this song purely for the sound. Rocking, driving and intricate musical hooks that reveal themselves with each listen. I love this song! 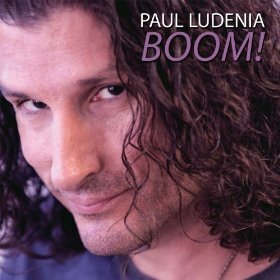 If you haven’t heard of Paul Ludenia’s work before, “BOOM!” is an excellent CD to start with. I would also encourage you to keep track of his musical career at www.paulludenia.com. Me thinks this boy is going places. I really do.